By now, you know I like nice stuff. Scoring a killer deal on luxury goods is one of my greatest pleasures in life. I can’t reveal the details of my greatest score of all time – getting this Burberry coat for free! Yes, free! – but I definitely have a system for finding hidden deals or at least getting a little something extra with almost all of the major purchases I make. It’s definitely part of the thrill of the hunt. I’m a major sucker for beauty gifts with purchase. I’ve been loyal to Bobbi Brown cosmetics for nearly 20 years and she deserves a post all of her own (Top 5 celebrities I want to befriend, for sure). If you watch carefully you can get Bobbi gifts with purchase from time to time from Nordstrom or Neiman Marcus, often in conjunction with an in-store Beauty Event. Usually it’s a mini version of one or two products, and I typically hoard these for when I travel. 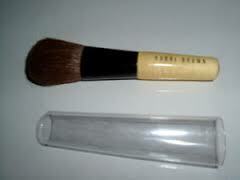 The best scores, IMHO, are travel makeup brushes with full-sized heads and short handles. This blush brush was part of a recent promotion at Nordstrom. I pulled this picture off of the internet, so it’s not the best, but you get the gist. Perfect for travel! Hands down, though, the best free swag comes directly from Bobbi herself. If you sign up for emails (or even texts!) from her website, you sometimes get the chance to shop new items first and there are almost always deluxe samples that come along with any purchase. The packaging and gift wrapping are also superb, and it’s easy to qualify for free shipping. Another way to get a little something extra is with Loyalty Rewards. I don’t have many credit cards, but I do have them for the three places I shop the most: Nordstrom, J. Crew and Banana Republic. Each has a reward program to send you gift certificates for future purchases based on the amount you buy. As I posted last week, Nordstrom recently offered up the unicorn: A ten point per dollar day. That’s when you splurge. You don’t get an immediate deal that day, but you get incremental $20 coupons for the future, and I always know I’ll be baaaack. FLD tip: If you want to go big and get a Vuitton bag, the Nordstrom store on Michigan Avenue in Chicago is the only one in the chain that carries them. The time to buy is when they have a scheduled double or triple points day (or if your Reward Level allows, you can schedule your own personal triple point day). A technicality in the reward system only permits double – not triple or higher – points per dollar on Vuitton purchases, but trust me, even double points on a bag that spendy will snag you at least $20-$40 back. Neiman Marcus offers a similar deal a few times a year, where you can get a gift card up to $500, depending on the amount you purchase. If you have your eye on something, it’s worth the wait. One really nice bag or a couple of pairs of shoes can easily net you $150. I don’t shop at NM that much, but occasionally I will since they carry some brands I like (Gucci, Clare Vivier) that Nordstrom doesn’t. Drugstore.com will usually run a 20% off promotion close to the holidays. I fall in and out of love with this brand, but currently I’m back in like with Philosophy. They have a lot of widely-pleasing scents and some nice gift sets, and Drugstore.com has a huge range of their products. You can also use the discount on another of my all-time bath and body favorites, Bliss, as well as any pricey hair tool (flat iron, etc) that ‘s on your wish list. J. Crew used to be really stingy about discounts, but they’ve been coming a lot more often in the past couple of years. Sometimes you need to buy a minimum to get 25-30% off, but it’s pretty easy to do. Where J. Crew really rocks is that they frequently add an additional 30-40% off items that are already on sale. This is where you score the big deals here. (FLD tip: If you love something at J. Crew and it’s no longer available, keep checking back. They often seem to sneak a few extras in or something will surprisingly return when all hope seemed lost. Their website will also sometimes post a discounted price for an item that’s just about to go on sale, but hasn’t officially hit the sale rack yet). I’ve mentioned this before, but don’t ever pay full price for anything at Banana Republic, Old Navy or the Gap. Wait five minutes, and it’ll be on sale. Their deals are so frequent that I’ve become really picky about them, and I usually don’t bite unless something’s 40% or more off. Shipping is almost always free, too. A couple of other good brands fall under the Gap umbrella, namely Piper Lime and Athleta. They aren’t as generous with their sales, but every once in a while, they’ll float a 20% off deal. For Athleta, that’s when it’s time to stock up on cute workout everything, and the Piper Lime site gets you some deals on desirable brands like Rag & Bone and Vince. Another designer I love is Tory Burch. A few times a year (Memorial Day is usually one), she’ll run a Friends and Family event with a flat 30% off or else a graduated promotion where the more you spend, the bigger discount you receive. Obviously, this is the time to stock up on Reva flats. I’m often too cheap to pay full price for Tory, but that 30% discount can put me past the tipping point. The same thing goes for Kate Spade. Out of all the stuff she designs, I love her jewelry the most and own more than I should probably admit. On top of Friends and Family events, she’ll occasionally run flash sales where you can get amazing deals on merchandise that just went out of season. Sign up for her emails and you’re in the loop. Another place I absolutely love for gifts is Henri Bendel. Their house brand candles are simply the best in the world. I’ve given them for hostess gifts a thousand times and everyone goes nuts for how beautifully they’re packaged and how great they smell. They’re expensive, though, and I never pay full price. My second best shopping score: Once there was a packaging error (but one that no one would really notice) and they were 75% off. I bought 40. [Why I love Ever Patient Spouse so much: Many other spouses would have filed for divorce on the spot, but he just asked if I was planning to open a candle shop and then sighed and shook his head, like always]. And you’re in luck: Bendel’s is having a promotion right now! Go get some candles. I’ve always been a MAC girl but may give Bobby Brown and her insider’s deals a shot.